Keep an eye on your family jewels if you have the good fortune to venture out to Beverly, Mass. between now and October 10 to see the North Shore Music Theatre’s raucous production of Jeffrey Lane and David Yazbek’s outrageous celebration of lying, cheating, scheming, and double-crossing, Dirty Rotten Scoundrels. 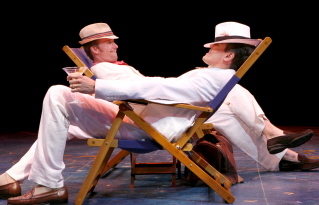 This very funny musical adaptation of the zany 1988 film about dueling con artists on the French Riviera earned 11 Tony Award nominations when it debuted on Broadway in 2005. Had it not opened the same season as blockbusters Light in the Piazza, The 25th Annual Putnam County Spelling Bee, and the even more irreverent, star-studded juggernaut Spamalot (which went on to win the Tony for Best Musical that year), Scoundrels could have stolen a lot more attention – and acclaim. NSMT has assembled a topnotch Broadway-credentialed cast that leaps headlong into the lunacy created when lowlife American grifter Freddy Benson (D. B. Bonds) stumbles upon the debonair Lawrence Jameson’s (Brent Barrett) elegant swindles and wants a piece of the lucrative action. At first repulsed then intrigued by the idea of teaming up with someone so “deliciously low,” Lawrence ultimately decides to take Freddy on as his protégé, teaching him how to dress, speak, eat and behave in polite society. When their egos get the better of them and they decide this town isn’t big enough for the both of them, they make a bet to see who can be the first to fleece naïve American heiress Christine Colgate (Brynn O’Malley) out of $50,000. The comedy escalates as the ruses Lawrence and Freddy invent to outdo each other become more and more preposterous. As Lawrence Jameson, Broadway veteran Brent Barrett (Chicago, Phantom of the Opera, Kiss Me, Kate, Annie Get Your Gun) is as devilishly handsome as he is charming. He literally seduces wealthy and vulnerable society women with one hand while figuratively picking their pockets with the other. He combines an effortless sophistication with a child-like joy that even makes his unbridled egotism appealing. Add a velvet voice that makes David Yazbek’s score sound more potent and sincere than it ever did when sung by the role’s originator John Lithgow – or even his masterful Broadway replacement Jonathan Pryce – and you have a totally irresistible dirty rotten leading man. Barrett’s magnetic attraction does shift the balance of the relationship between Lawrence and Freddy a bit, making this Dirty Rotten Scoundrels more about the jaded pro’s renewed interest in the game than the young upstart’s manic desire to acquire “Great Big Stuff.” But that’s really all to the good. It allows us to see Lawrence’s newly minted Pygmalion come back to life as he first instructs then is challenged by his budding Eliza. We also get to see the fondness these two unscrupulous con men develop for one another – albeit cloaked in delectably sadistic humor. A commanding Lawrence also gives D. B. 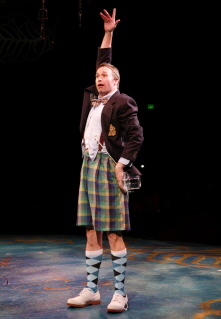 Bonds as Freddy the chance to flesh out subtler layers in his character than he did when he previously performed the role on the national tour a few seasons back. Here Bonds balances his moments of inspired comic madness with the heart of a crass uneducated street kid desperately seeking paternalistic approval. His hunger for fame and fortune is also very real and comes from a place of palpable deprivation. This complexity now makes his Freddy sympathetic and likable, which is essential if one is to believe that an innocent like Christine could fall for him and the ridiculous charade he foists upon her in his attempt to rob her blind. Lynne Wintersteller and John Scherer play lovelorn social misfits Muriel Eubanks, a rich American divorcee with too few meaningful hobbies and too much time on her hands, and Andre Thibault, Lawrence’s majordomo and sometime chief of police of Beaumont Sur Mer. They take what could be throwaway characters and turn them into a delightfully inept romantic couple who just may be able to stop living vicariously now that they have found each other. They sing and dance together divinely, and their deadpan comedy is a refreshing counterpoint to the insanity that is swirling around them. As funny as the entire cast is, however, hands down the funniest twenty minutes of stage time goes to Broadway firecracker Jen Cody. This totally uninhibited ball of dynamite plays pistol-packing Oklahoma oil brat Jolene Oakes, and by the time she has finished her big number “Oklahoma?” the audience, like Lawrence Jameson, doesn’t know what hit ’em. With guns blazing and big hair flying, Cody terrifies the typically unflappable con man by heel kicking, lap dancing, and practically calf roping him into a redneck wedding. Director Mark Martino and choreographer Denis Jones add a brilliant touch by turning the singing and dancing chorus (straightforward Rodgers and Hammerstein cowboys in the Broadway production) into toothless trailer park couples replete with hair curlers and black and blue eyes. Insulting? Absolutely. Funny? Excrutiatingly so. The round stage at NSMT makes opulent scenery impossible, so one has to imagine as best one can the magnificent staircase, furniture, paintings and collectibles that ostensibly make Freddy drool when he first appears at Lawrence’s seaside villa. But clever staging helps to make up for the sparseness, and the tremendous slapstick agility of Barrett, Bonds and company create feasts enough for the eyes.